Geneva is fun, loving and very social. She has adopted Coraline as her unofficial big sister and emulates whatever she does. They are so similar in behavior and appearance that I sometimes have to take a second look to confirm which is which. Luckily, Coraline, the elder of the two, is a good role model for Geneva or it could be double trouble! My partner, Lucas Mucha, raises Cane Corso mastiffs, and one of his 130-pound boys has assigned himself as bodyguard to Coraline and Geneva. The three dogs have become best friends. Geneva is equally loving towards people and other dogs. She shows no preference. Whether she’s in the yard playing with the dogs, or chilling by my desk while I answer my e-mails, she is fully content. Geneva takes life as it comes. I attribute that temperament to both Coraline’s influence and good breeding. Like several of my girls, Geneva came to me from a colleague and good friend, Pat, who has been breeding Bernese for nearly 20 years. 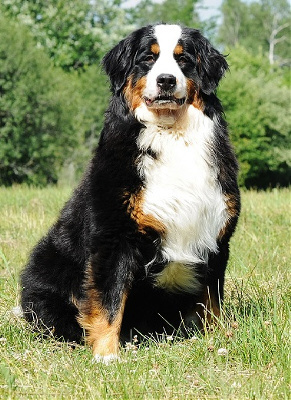 In fact, I bought Mocca, my beloved first Bernese, from Pat when I was only 16 years old. I’ve long admired the care Pat takes in breeding perfect family dogs with extensive histories of genetically cleared and tested parents. I confess I went to buy just one or two Berners from Pat, and ended up with six! 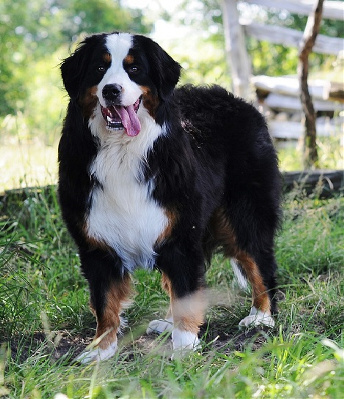 Quality Bernese are to me what quality shoes are to other women: irresistible. I was able to go through Pat’s detailed records and meet parents, grandparents, and even great-grandparents. That is invaluable to me—something normally I can achieve only with my mom’s dogs. I now have some phenomenal new lines in my program. Geneva’s mother is Marley, who has been cleared by OVC for hips and elbows. Her most recent ancestors are from the United States and both her parents were bred at Pat’s kennel. Marley also comes from a line of cleared parents. Geneva’s sire is Jethro, who has OFA “good” hips. 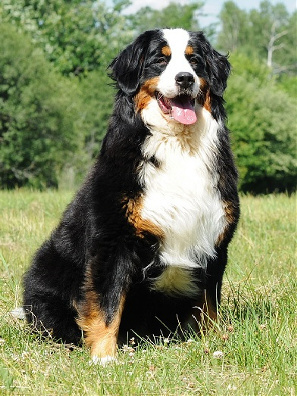 He scored in the 90th percentile on the PennHIP scale, which means his hips are 90 per cent better than any other Bernese tested—an amazing score. Jethro’s lines go back to Finland on his father’s side, and he’s American on his mother’s side. He comes from a long line of sound, tested ancestors.